Many travelers who earn frequent flyer miles aren’t always interested in booking an award ticket. Instead, they want to use their miles to upgrade a ticket they’ve already bought with cash. Upgrades and award travel have a lot in common, but the rules are unique for every loyalty program. This post discusses how to upgrade a ticket purchased with Delta Air Lines. There are two important rules for booking upgrades on Delta. It’s very important to understand these before you book a ticket as any mistakes could require expensive change and cancellation fees. Please ask your questions here or contact a Delta representative for clarification. First, you must use Delta SkyMiles to upgrade your Delta-operated flight; any miles earned with another program like Alaska Airlines won’t be helpful. This same logic works in reverse: you cannot use your Delta SkyMiles to upgrade a flight operated by another airline. You usually can’t upgrade codeshare flights, either, which may be operated by Delta but have another airline’s flight number. It helps to book your flight through the Delta website to avoid codeshares. Second, upgrade inventory is limited. Just because there are business class seats for sale does not mean that you can upgrade your economy class ticket. Like award flights there are only so many for sale and this number changes often. 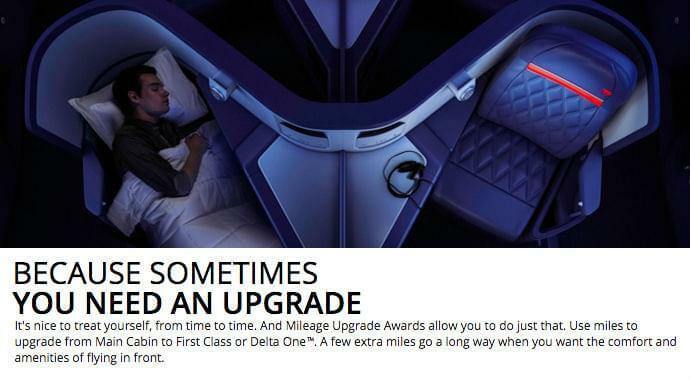 However, if a business class award is available then it is likely that an upgrade award is also available. Why would someone book an upgrade if he or she could just get an award ticket? Because award availability is often limited, upgrades make it easier to secure travel on the flights you need when the destination and dates aren’t very flexible. You may need to fly even if your upgrade doesn’t clear and you have to stay in economy class. If you place your name on the waitlist and an upgrade does become available at a later date, you generally have access to it before it is offered as an award. Also, some people don’t want to travel any more than they already do, or they need to continue booking paid tickets in order to earn the miles they need for elite status. Booking “extra” award travel doesn’t appeal to everyone. Keep in mind that no kind of upgrade — elite status, upgrade instruments, or miles — is possible if you purchase one of Delta’s Basic Economy fares (in the E fare class). It is not possible to search for available upgrades on Delta’s website or on third-party websites. Although you can always call a Delta agent and ask for assistance, sometimes it’s faster to search online if you want to review many dates before you book a flight. The alternative is to search for an award ticket. The R fare class used for first class awards on domestic flights generally matches the same available inventory in the RP fare class used for mileage upgrades. Similarly, the O fare class used for business class awards on Delta One flights (international business class and some premium domestic routes) will match the OP fare class used for mileage upgrades. Not all awards are the same, however. Delta has a variety of price points, and only the cheapest awards will be available in R or O. Be sure to check the fare class information on the results before you make the next step. Mileage upgrade awards that don’t clear immediately will be placed on a waitlist. However, that waitlist does not carry over to the day of departure. This is the one exception, since nearly all other upgrade types do carry over after check-in. With new rules implemented on June 1, 2016, it’s now possible to use miles to upgrade a larger variety of fares. These include: Y, B, M, S, H, Q, K, L, U and T fares. You can also upgrade flights to a broader range of destinations, including the U.S., Canada, Mexico, Central America, the Caribbean, and what Delta defines as Northern South America (Peru, Ecuador, Colombia, and Venezuela). Upgrades to other destinations that Delta serves can also be upgraded. However, only Y, B, M, S, H, Q, or K fares are eligible. The biggest issue is that upgrade prices are outrageously expensive. There is no co-pay, but you may be asked to pay between 15,000 and 115,000 miles each way to secure an upgrade. Generally speaking there are three different upgrade prices for each route, with more miles required to upgrade cheaper fares. Delta does not actually publish these prices; instead, members of FlyerTalk have created their own list from crowdsourced information. 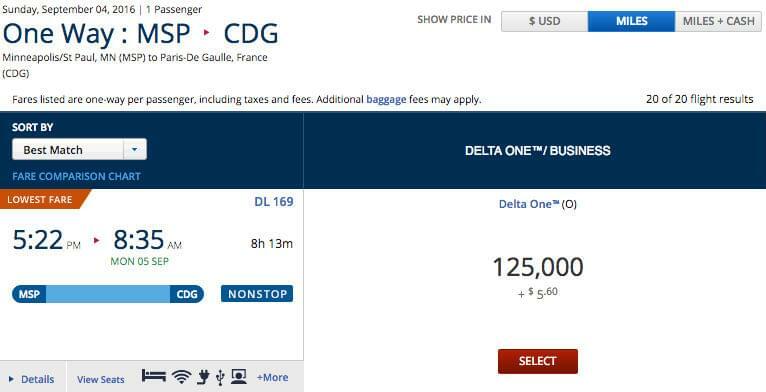 Delta permits its members to redeem SkyMiles for upgrades on only two other carriers: Air France and KLM. Furthermore, these flights must be booked as Y, B, or M fares, which are the most expensive. You may not need to redeem miles at all. Elite members in every Medallion tier can upgrade in advance when they purchase a full fare ticket in the Y fare class. These tickets also provide better priority. All full fare tickets will be cleared before discounted fare classes. The next section covers upgrade priority in more detail. If your upgrade doesn’t clear in advance, it will move over to the upgrade waitlist at the gate.The waitlist will evolve over time as complimentary elite upgrades become available in the last few days before departure. However, mileage upgrades still take precedence. The biggest issue is that if your upgrade does not clear before check-in, you will not be able to upgrade at all and the miles will be returned. Upgrades using miles are not possible once the waitlist moves to the gate agent’s control. Therefore, the only passengers who might concern you are those using Global and Regional Upgrade Certificates, since they are the only passengers who can both upgrade early and take priority over mileage upgrades. 1. Global Upgrade Certificates have top priority, then Regional Upgrade Certificates. 2. Upgrades using miles will clear next and are ranked by the passenger’s elite status. Note that all mileage upgrades must clear before the check-in window opens (typically 24 hours before departure). Fare class is not a factor. 3. Passengers who have elite status and purchase full fare tickets will receive complimentary upgrades after passengers who use miles. These upgrades are ranked by elite status. 4. Remaining upgrades for paid tickets, award tickets, and “Pay with Miles” tickets are upgraded last.